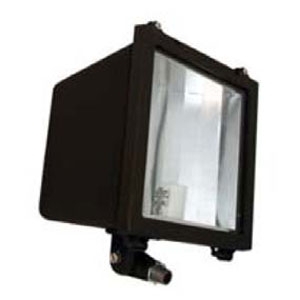 The MFL Mini-Flood Light (shown with Yoke Mount) features a die-cast aluminum housing with integral hinging feature for ease of maintenance. Ideal for buildings, parks, signage, sports field, parking areas or anywhere general floodlighting is desired. Tempered glass for maximum light distribution. An optional polycarbonate shield or wire guard, for vandalproof protection, is available. Anodized aluminum reflector designed in conjunction with diffuser for maximum efficiency. Heavy-duty adjustable yoke for excellent aiming capabilities. The MFL is fully-gasketed and of weather-resistant construction. For wall or ceiling mounting. 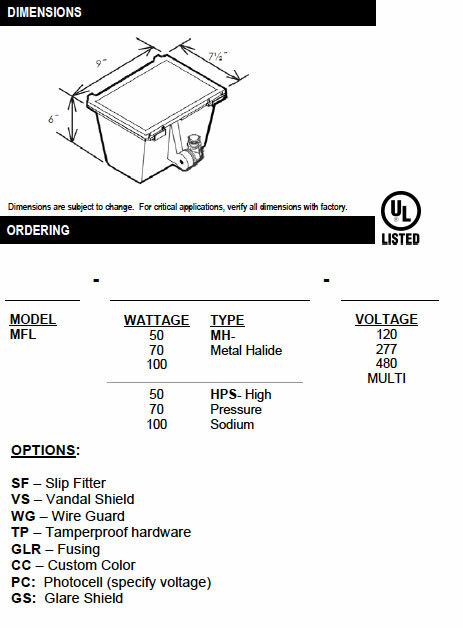 Designed for max of 400W metal halide or high-pressure sodium. Exterior housing is finished in architectural bronze as standard, also available in custom colors.